Life in the Hive: What's for Dinner? SooOo on the way home tonight from work I was racking my brain about what I should make for dinner. I knew we didn't have much at the house so I would have to be creative. Mr. B had bought some artichoke hearts in a can randomly a while ago. They've been sitting in the cabinet ever since, so I wanted to try to use them. Last night I baked so chicken drum sticks and we had some of those left over. And we always have some pasta. Then I came to thinking maybe I could try to make a pasta dish out of chicken and artichoke dip, cause that's all i could think of to do with the artichokes. I checked the fridge and we had about half a thing of cream cheese. So I figured with those basic things I could whip it up! I've never made artichoke dip before so I quickly googled it to get and idea of it. So here's what I did. I got some pasta boiling, about half a box of penne. (actually I thought I had put the pot on to start boiling, however after googling the dip I walked into the kitchen with the back burner blazing red hot and the pot of water freezing cold... oh well) I put some olive oil and a bunch of garlic ( cant have enough garlic) in a pot to start cooking. Then I grabbed two drumsticks and got them meat off of them and added that to the garlic and olive oil. Then I added the about half a package of cream cheese, about a table spoon of mayo, a handful of Parmesan cheese, sprinkle of garlic pepper and mixed it all up! Oooh and i found a frozen hunk of freezer burned mozzarella cheese in the freezer and added that too and VOILA! Deliciousness!!! 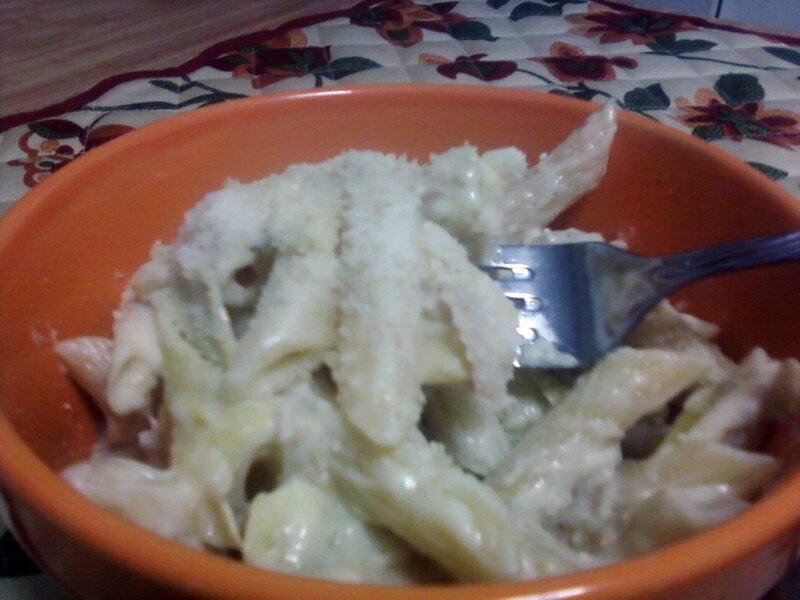 :) :) Hot chicken and artichoke dip with pasta! Yum!